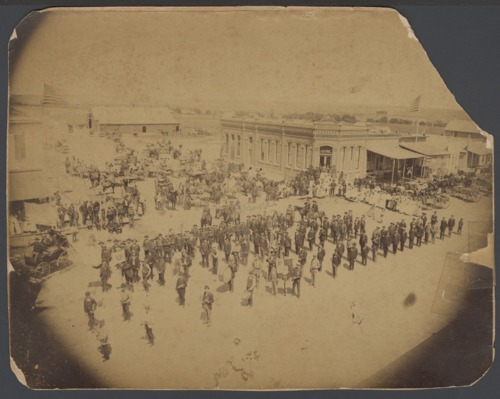 This photograph shows a Fourth of July parade in Concordia, Kansas. One of the parade participants is holding a Knights of Pythias banner. The man on a horse near the center of the photograph might be Francis E. Ruff, who was the first town marshall of Concordia, Kansas. He homesteaded in Clyde County [possibly Cloud County] in 1879 and donated a plot of land for the first cemetery. Ruff was a stone mason and made grave stones.